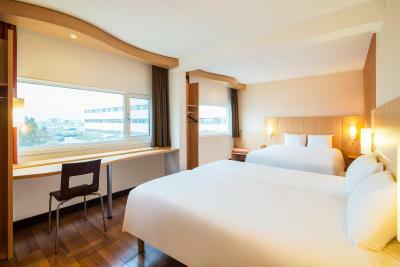 Lock in a great price for Ibis Schiphol Amsterdam Airport – rated 8.1 by recent guests! The lobby has hot water which is good. The location is good, there is bus to the center. The location of our room. Friendly and helpful staff. This was my second stay, and I was not expecting it to be as great as it was. Most affordable hotel we could find at short notice. Good location near Schiphol airport. Free shuttle service was fine if crowded - they seem to have reduced the frequency of service. free shuttle from & to the airport is superb. Roberto, the shuttle driver is very welcoming. makes the journey fun. the 5 euro voucher for every stay in exchange for room service. The bed was comfortable, which was the only saving grace for me. Room was brand new. Bed was very comfortable. Super clean. 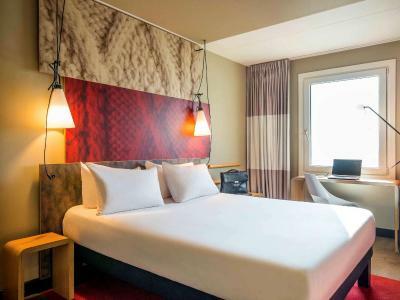 Ibis Schiphol Amsterdam Airport This rating is a reflection of how the property compares to the industry standard when it comes to price, facilities and services available. It's based on a self-evaluation by the property. Use this rating to help choose your stay! 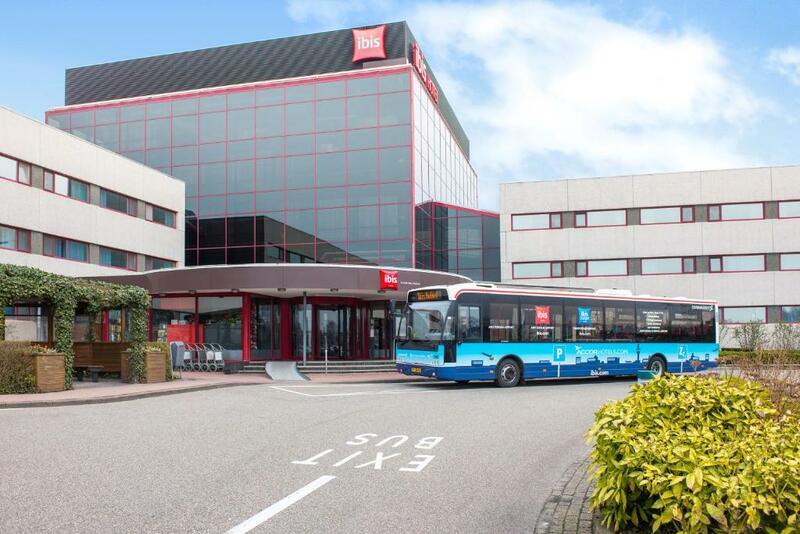 One of our top picks in Badhoevedorp.Amsterdam Airport ibis offers a free shuttle service to and from Schiphol Airport. 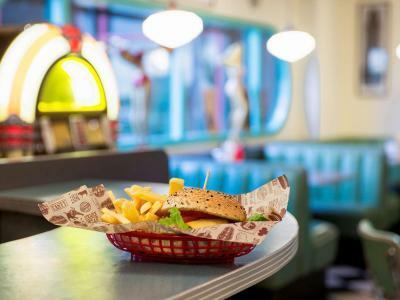 It features free fitness, a 24-hour Take Away and an extensive breakfast is served from 04:00 until 12:00. 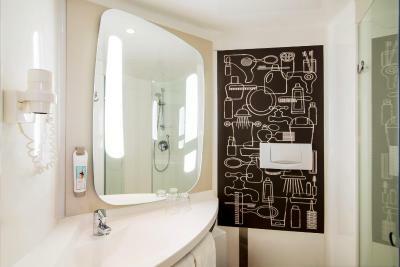 The modern rooms at ibis Airport come equipped with flat-screen TVs with satellite channels. They have a private bathroom with free soap and shampoo products. The hotel houses several eateries: an international restaurant, a burger/sandwich bar and a Grand Café. 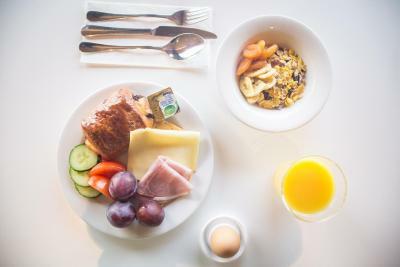 Guests can also opt for a breakfast in the breakfast restaurant. This ibis is located close to the A9 and A4. From the airport, which is 1.9 mi away, there are direct connections to Amsterdam Central Station, Amsterdam RAI and the WTC by bus and train. 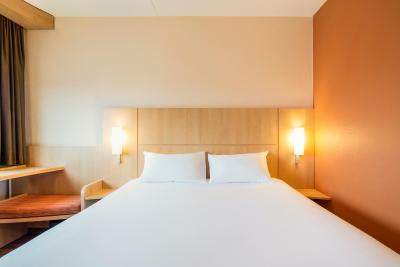 When would you like to stay at Ibis Schiphol Amsterdam Airport? This lightly-decorated modern room includes hardwood floors, flat-screen TV and box-spring beds. Public parking is available on site (reservation is not needed) and costs EUR 19 per day. This quadruple room has a soundproofing and satellite TV. This triple room has soundproofing and satellite TV. It offers 3 single beds. 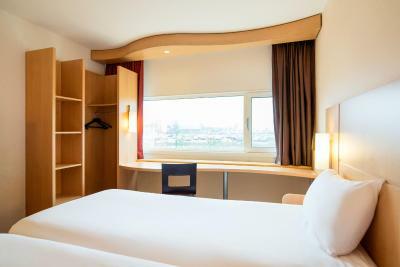 This Superior Double Room is furnished with premium materials and features a large double Sweet Bed by ibis. The room has heating, free access to the Sweet Lounge by ibis and a private bathroom. Extras include air conditioning, a USB charging hub, flat-screen TV and free WiFi. 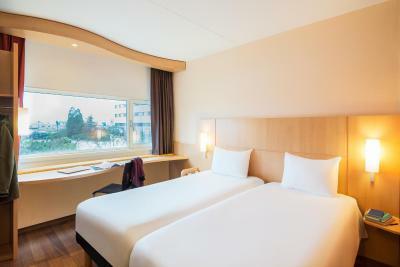 This Superior Room has 1 large double Sweet Bed by ibis and a sofabed. The modern room is furnished with premium materials and it has a private bathroom. Extras include air conditioning, heating, free access to the Sweet Lounge by ibis, free premium WiFi, a USB charging hub and a flat screen TV. This twin room has a satellite TV and soundproofing. House Rules Ibis Schiphol Amsterdam Airport takes special requests – add in the next step! ATM card Ibis Schiphol Amsterdam Airport accepts these cards and reserves the right to temporarily hold an amount prior to arrival. Ibis Schiphol Amsterdam Airport accepts these cards and reserves the right to temporarily hold an amount prior to arrival. Please note that the free airport shuttle service is available from 04:48 until 01:15. Please note that guests are required to show the credit card which has been used to make the booking, upon arrival. If this is not possible, guests should have an authorization form, signed by the credit card holder if he/she is not traveling along. Please note that it is possible to pay with a debit card upon check-in. Pets are allowed in the rooms for a surcharge of 20 EUR per day. Please note that parking is not included in the rate. A surcharge is required for parking (see policies). Only have 3 in 1 shampoo & bath gel & feel itched on the next day. No coffee or tea in the room. The hotel's shuttle is overloaded and its use is tense. Wonderful three-star hotel, pleasant and quiet , The distance from the airport is about 20 -30 minutes by car, but there is a possibility to travel in all directions from there by public transport. Lovely team, and there is the opportunity for small food and drink at any time. My room was anything but quiet. It was close to the bar at ground floor so I heard literally anything from the hallway. Fortunately I spent there just one night. The room was really small and at triple sharing, there was hardly any space to move at all. It is a bit far from Amsterdam, but we knew that already. 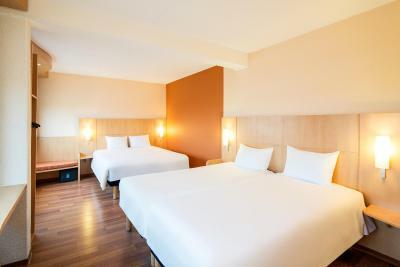 Ibis standard, good rooms! Welcoming staff as well! Can hear noise inside the room. Sound proof not so good.